The NBA superstar, Dennis Rodman, has teamed up with MX Digital, a leading game developer, to launch a series of online casino games. The Hall of Famer and actor can now add ‘video-game-star’ to his list of accomplishments. 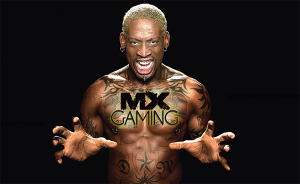 Dennis Rodman has teamed up with MX Digital to launch a number of online casino games. Rodman recently appeared as a spokesman for a top European casino operator which resulted in the casino generating a record $1 million worth of bets following the promotion featuring the celebrity.